Although it looked like a jittery start by the time we got all the 13 volunteers to reach our venue for Toybank's 1st distribution event, the event went on to become an awesome start to our activities in Delhi/NCR! After chatting up with the volunteers for few minutes we kick-started the event at 10 15 AM. The Mobile Creches centre had children from less than a year up till 12 years of age. Some of the infants were busy sleeping in the jholis adjacent to the walls inside the centre. Also a tetanus vaccination camp was happening for the infants at the same time. Toybank volunteers joined 3 different groups divided on age groups of children and started playing various games to entertain the children. One group kept the children busy dancing, singing and stories using toys as props while the other group was busy playing pakadam-pakadai. Another small group of volunteers were busy pacifying the infants who were crying out loud after the vaccination. We spent over an hour playing with the children and then started with distribution of toys and Parle-G biscuits. We also gave few educational toys, puzzles (fun with Maths, parts of human body, etc), toddler toys to the centre's toy library. 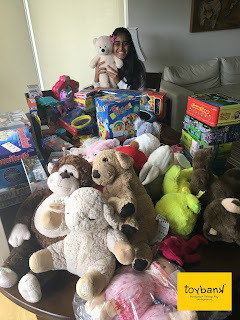 We definitely missed Shweta Chari, founder of Toybank who is our constant pillar of support and one who always manages to show her support with her presence at the events of every new Toybank chapter - Bangalore and Pune. We could not have asked for a better start for Toybank Chapter in Delhi/NCR! Toybank thanks all the 13 volunteers who volunteered with us for the first time here. We thank the donors who sponsored the Parle-G biscuit packs for the 70 children at the Mobile Creches centre. We also thank the toy donors from MPS for their generous toy donations! The children sure did have fun and so did all the volunteers! Catch all the action here! "This visit was really good and we were enjoyed lot with small kids. This experience is really wonderful and unforgettable. In my view we will collect some goods like cloth etc. for small kids too. I really appreciate the Swetha great efforts to manage this event nicely and hope we will come together to do some more event in future." "I enjoyed the day with kids a lot and am looking forward to be a part of such initiatives. I suggest that along with toys we should have also donated other essential stuffs like clothes, books and medicines. It was a wonderful experience altogether." "It was very encouraging to see so many young people volunteer. 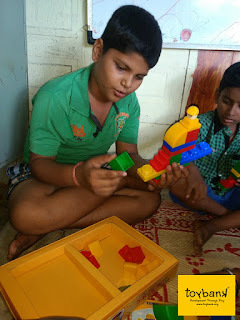 Since the group of children I was working with were mostly of the age group 1-3 years, it was not possible to get them to participate in an organised group activity. One to one interaction with such small children thus becomes inevitable even though it was not part of the guidelines. Despite the limitation of time and space and lack of orientation, it was a fruitful exercise and a commendable event." I think may be next time, visiting the site beforehand is a suggestion and I think you had mentioned this. Volunteers must meet beforehand to plan the event, activities, do's and dont's.We should decide or atleast discuss beforehand everybody's responsibility to ensure that you don't have to do the running around. For ex. one group takes care of distribution,other to list down the names of children and another to plan activities for kids etc.Also,some volunteers could take responsibility for stuff like water, snacks etc..just in case duration of the event is longer.I think the distribution process could be alot more fun. I am glad I am a part of Toybank community!Cheers to many more Toybank Delhi events!" "The event was really good, entertaining and gave us a in depth view of that part of the scoiety, which we people might have left behind somewhere in the corner. Special thanks to you for arranging such event and give us a chance to contibute for a social cause. I ll look forward for such events in future. Yes, next time we need to arrange some pictures of proffesionals like engineer, doctor, lawyer etc. so that to get the children acquainted with all of them. Other stuff as well, more it will be pictorial, more easily the children ll grasp and adapt." "Namaste from Pratham Books! It was totally a new experience for me.Though I have been to some other activities ,but this was a different experience and learning all together.It's a nice way to connect directly with the kids and with the community as well.I feel fortunate that we give them some happy moments to them and made them smile.I really feel satisfied that we contributed something to the society. There are some points which I feel can be worked on for the further events of Toybank. 2. Some planned activity or some story cards reading or games for target audience(age group we are catering),which would help us to keep them involve. 3. We can add books,clothes with the toys as a gift. 4. Visit the venue prior one week to get proper idea about the location and condition of the shelters or institutions which would help the partners or other volunteers to contribute some other required things." "It was a really good experience with the small kids. I enjoyed a lot and hope they too have enjoyed and learnt many things from us. I really hope next time many of us will be encouraging more people and volunteering for the same and will be collecting some useful things for the children." "The experience with kids has been wonderful for me and some where at the core of my heart I always wanted to do such type of activity, do my bit for the needy.I would also like to suggest to go to some orphanages, slums, children of prisoners in jail etc, if possible with the formalities in place. However this was an awesome effort by you and I look forward for such an activity to take place soon."